Fried Green Tomatoes at the Whistle Stop Cafe is about the bonds of a small Alabama town. It’s about community, friendships, and love. Told in an easy, comfortable voice, the book alternates between several narrators. We learn town news in notices from the post mistress’s bulletin highlighting noteworthy events such as a meteorite that smashes a neighbor’s radio, boy scouts who were awarded merit badges, and updates on her husband’s snoring, wrecking the car, and losing his National Geographic Magazine. The true bones of the book lies in the lives of Idgie and Ruth whom we discover in a third-person voice and in the reminisents of a chatty, congenial, elderly woman, Mrs. Threadgoode. Mrs. Threadgoode befriends Evelyn, a discontent homemaker, at the Rose Terrace Nursing Home where Evelyn regularly waits in the hallway while her husband visits his mother in the 1980s. In Mrs. Threadgoode’s endearing manner she unfolds the story of Idgie and Ruth’s friendship and love revolving around the Whistle Stop Café starting in the 1920s. Evelyn keeps coming back to learn more about the women and even a murder that took place, and through these stories and the encouragement of Mrs. Threadgoode, Evelyn eventually finds herself. This is a warm, tender book that gets a big thumbs-up. 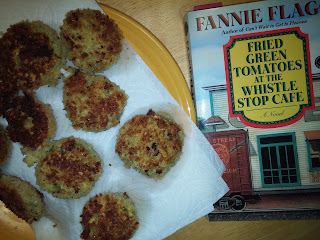 At the end of the book, Fannie offers recipes of many of the dishes served at the Whistle Stop Café. I love when novels include recipes! My husband made me the fried green tomatoes from the book—yum! And I made the pecan pie—double yum! Making recipes found in novels is a fun and delicious way to revive memories of a book. I’m thinking I’ll be bringing thoughts of Idgie and Ruth to life again and again with that pecan pie. Even though most of my book club members had already seen the movie, we chose to read the book and, no surprise, everyone loved it. My fellow readers did mention that there were a lot more characters to keep track of in the book. Also the book doesn't follow the timeline as smoothly as in the movie; you had to pay a bit more attention as to what year was being discussed in the book. There were a few things that were different than the movie, but that didn't seem to make any difference because all members who had seen the movie, found both the book and movie were worth reading and seeing! Another Fannie Flagg book I’ve read and recommend is a perfect treat for the holiday season. Click to read more about Fannie Flagg and A Red Bird Christmas.